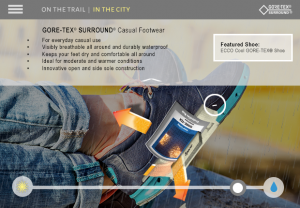 The GORE-Tex interactive unit for the new lifestyle and “surround” technology was a multi-faceted approach. This was part of a content marketing program that included product reviews, feature placement on buyers guides, and articles about the new technology and products hitting the market. This project involved a strong brand-engagement play as well as content marketing and content adjacent positioning. 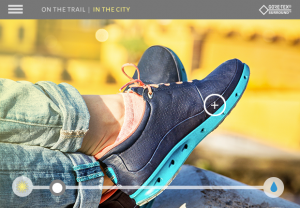 This piece demonstrated the versatility and responsiveness of the technology and invited users to view details and see the shoes in action across a changing climate and 2 distinct environments. In the city scene users could change the weather from sun to rain using an interactive slider element. By selecting detail points on the image users were able to expose the technology descriptions and gain a better understanding of the products and the use in each environment. Take a look at the finished product and play with the items yourself.